Doctor Who: It's A Wonderful (Twelfth) Life | Warped Factor - Words in the Key of Geek. "Some days are special. Some days are so, so blessed. Some days, nobody dies at all. Now and then, every once in a very long while, every day in a million days, when the wind stands fair, and the Doctor comes to call, everybody lives"
Her possible return as a ghost/spirit in this year's Christmas special (which is just eleven weeks away now) offers up a potentially intriguing opportunity for Doctor Who to continue its fine festive tradition of borrowings from seasonal literature and/or music - see The Unquiet Dead with a cameo by Charles Dickens, and A Christmas Carol with its heavy leaning on the great author's winter warmer. While The Snowmen would make sure we'd all rethink Walking In The Air, The Doctor, The Widow & The Wardrobe's whiff of Chris de Burgh's A Spaceman Came Travelling, and last year's Last Christmas seeing Santa given a chance to show he's not all about making toys for good girls & boys. It also gave Steven Moffatt the chance to relieve himself of that pesky Wham! earbug and get in the mood to write his annual post-turkey with all the trimmings contribution to the festive telly schedules. "You go through all those presents and right at the end, tucked away at the bottom, there's always one stupid old satsuma. Who wants a satsuma?" Or his two subsequent rejigs in The End Of Time, and The Time Of The Doctor. 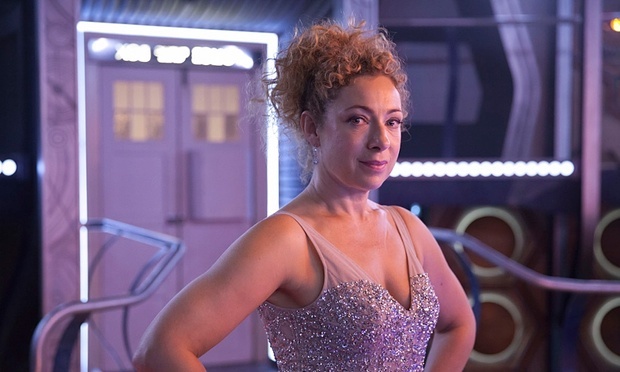 By which logic it can't be too hard to picture River as the Clarence to the Doctor's George, should his quest to prove himself a good man under that gruff exterior cause him to contemplate giving up the whole saving the universe thing. You'll recall that in It's A Wonderful Life the angel Clarence is able to show George what the world would be like without him into the bargain! And lest we forget he had previously retreated to Victorian London to lick his wounds following the loss of the Ponds, so embittered was he that he simply hid away on a cloud until Clara Oswald entered his life and reinvigorated him. CLARA: Do you actually live up here on a cloud, in a box? DOCTOR: I have done for a long time now. CLARA: Blimey, you really know how to sulk, don't you? DOCTOR: That's no more a box than you are a governess. With Jenna Coleman, and indeed Clara, soon to exit the series could the Doctor be set for another bout of brooding? Indeed it's not impossible to see Peter Capaldi's Twelfth as a man wanting to tell the universe to stop as he wants to get off, but could he really become so indifferent he'd seriously consider his darkest Christmas yet? If so, who better than the woman whose temper forced him to live with otters for a while to snap him out of it? The Doctor's encounters with River have all been out of sync, so there are many "spoilers sweetie" which she knows about him which she could use to show him all the life's he'd touched, and how different the universe would be without him. "...There was something I had to tell you, something important. What was it? No, hold on, hold on. Hold on, shush, shush, shush, shush. Oh, I know! Merry Christmas!"